Leo Babauta is the author of 'The Power of Less', a book that aims to help everyone cut through the noise and clutter so they can focus on what really matters. In the book, Babauta advocates a streamlined lifestyle. His strategy is to focus on a handful of important projects at any one time, to the exclusion of all the 'nice to have' projects that otherwise stop people achieving their higher goals. The book has chapters dedicated to time management, taking control of email, tackling clutter, improving health and fitness, slowing down the pace of life, and having a productive and happy daily routine. The core theme is the importance of setting priorities, establishing limits (less is more), and focusing on what's vital. As you might expect, the book is slim and to the point. In this exclusive interview, Babauta reveals how the principles of his book apply to writers. How did you manage the information and source material while researching and writing your book 'The Power of Less'? 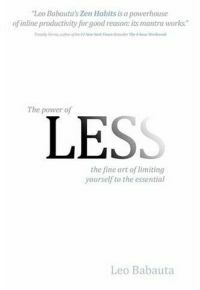 The Power of Less is based on my experiences and things I've learned in my life in the last few years, so research and source material wasn't much of a problem. I have been writing about these issues on [my blog] Zen Habits, so The Power of Less is a distillation of the ideas I've been writing about and an exploration of them in more depth. Information was managed through Google Docs -- I like that it's stored online and I don't have to worry about updating various versions of the document. I keep things simple, using just an outline for the book and filling it in. Recessions tend to hit the media hard, because advertising budgets are one of the the first things companies cut. What advice would you offer to those working in the media to help them to negotiate the tough times ahead? It's important to stay lean these days -- that doesn't necessarily mean cutting back on employees, but on other costs that aren't as necessary in these days of digital media. For example, a magazine or newspaper can be completely digital these days and cut out printing completely. Focus on gathering information, interpreting, telling stories, becoming more interactive and responsive. And do all this while being leaner than ever before. A reporter or editor, for example, doesn't need to work in an office if he has a computer these days. In fact, newspapers and magazines can be completely officeless if they're smart. One of your tips for a simpler life is to avoid advertising. For knowledge workers, the information they need is often supported by advertising. How can people strike a balance between wanting to avoid adverts but needing the media that they support? I noticed that your 'Zen Habits' blog includes advertising, for example! It's tough to find that balance between wanting to save money (and avoiding advertising is one way to do that) and needing to make money (and advertising is one way to do that). I don't think you need to go to extremes on either end -- you can avoid advertising as much as possible but you'll probably still see some of it sometimes, and you can make money without being completely reliant on advertising. On Zen Habits, many if not most of my readers see my posts without ads -- either in email or a feed reader. That's perfectly OK with me, as advertising is only one source of income and even if it dried up completely I'd figure out other ways to make a living while writing about things I love. Other non-advertising sources of income include selling ebooks, receiving donations (I find it humbling to live off the charity of others), and selling print books. Freelancing was another source of income but I don't do much of that these days. Another money-saving tip is to avoid spending money on newspapers, magazines and books. One of the challenges writers face is that they need a wide range of information from different sources to come up with fresh ideas. Can you offer any tips to help writers to better focus their media consumption? These days it's completely unnecessary to buy newspapers, magazines or books if you don't want to -- it can all be found online, or in the case of books, you can probably find it at a library or do a book swap online. For writers looking to focus media consumption, for most of us who don't need to be first to report the news, we don't need to consume that wide a range of media all the time. If you're researching an article or post or book, you can focus your research on just the sources that will inform or inspire your writing. If you need a wider range of media to get inspiration, then cast the net wider at that time -- don't consume that wide a range of info every single day just in case. One of your recommendations is for people to focus on a handful of things that are important to them. Others have written about the benefits that accrue from focusing energy on specific goals. It seems like there is a double pay-off here, for people who can focus on what they really want to achieve, and who can ensure that their 'stuff' contributes towards those goals. Any thoughts on that? The Power of Less suggests that you focus on one goal at a time in order to be more effective in accomplishing goals. More important than that is the micro-level: what you focus on each day, throughout the day. Keep your goal in mind, and do tasks each day that contribute toward that goal. And most important: do one task at a time. But I also think it's worthwhile to think about whether we really want to be so goal-oriented. If you always have your eye on a goal, and everything you do is focused on that goal, and your happiness depends on achieving it ... what happens when you do achieve it? Will you be happy then? Oftentimes, when we are so goal-oriented, we don't take the time to celebrate the achievement but instead look to the next goal, and then the next -- and so we're never happy, because we've never arrived at a destination. While it's important to have a goal so you're moving in the right direction, what's more important is the journey. Enjoy yourself, no matter what goal you're trying to achieve, and you can be happy now, in the moment. And guess what? If you enjoy the journey, you'll probably get to that goal someday -- but whether you do or not, you're happy. What top tips would you offer to others about writing a non-fiction book, based on your experience with 'The Power of Less'? I found that it's hard to run a blog and try to write a book and also work on other projects at the same time. Clear your schedule as much as possible so that you can focus on writing the book. Make the book your whole world -- strip away anything that gets in the way of writing. Having a hard time focusing because of email? Go on an email hiatus and only check once or twice a week. Reading too many things on the internet? Disconnect from the internet so you can focus. Are your blog or other projects getting in the way? Put them on hold, or have someone else work on them, or put them on autopilot. Whatever interferes with the book writing, strip it away. Focus entirely on the writing.